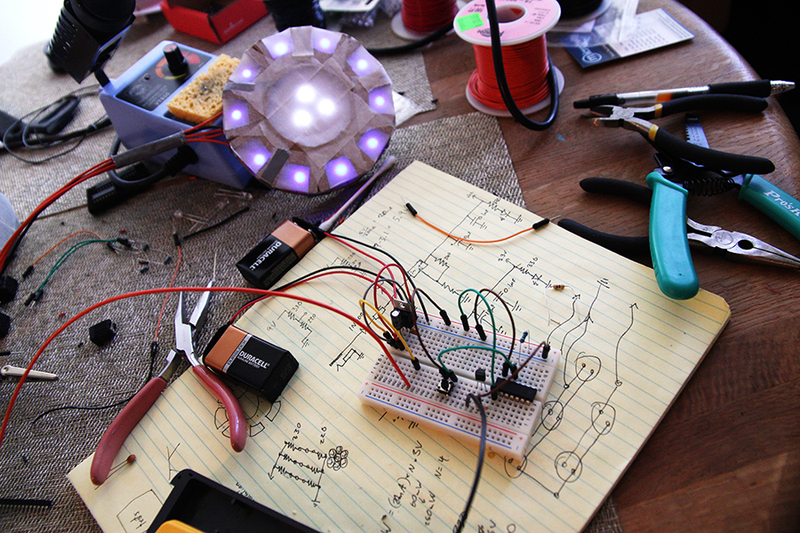 Used Halloween as an excuse to get myself back up to speed on basic electronics and Arduinos. Ended up with something with flashy lights that looked great in the dark. After finishing my grad school qualifying exams, I took a few days off work to get myself back into electronics. Halloween was coming up, so I could kill two birds with one stone by making some kind of light-up costume. 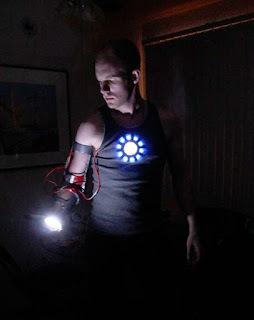 After searching around the internet for ideas, I found a few sites offering instructions on how to make an Iron Man costume using LEDs and miscellaneous hardware parts. I decided to model my costume after this image and include a microcontroller to control the LED brightness. There were four main components that needed to be built: the chest light, the hand light, the controller circuit, and the arm brace. 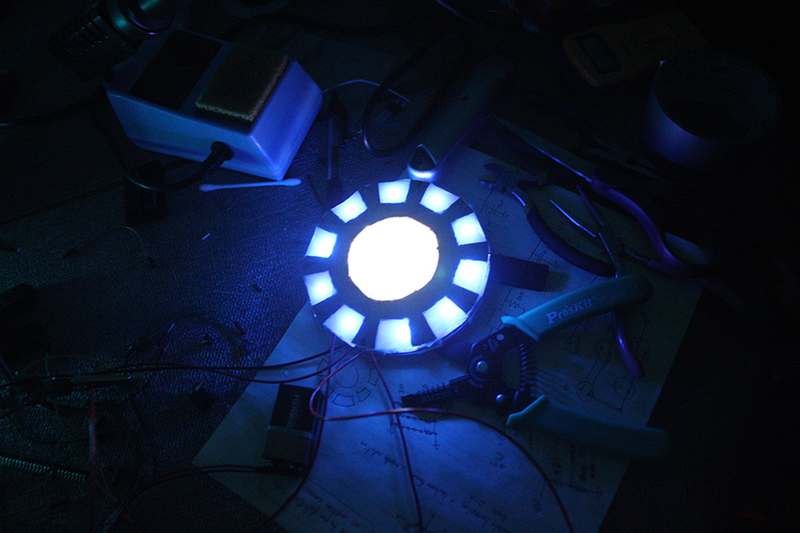 The chest light was made by punching holes in a circular piece of cardboard and gluing some blue and white LEDs into the holes. The LEDs were connected in series in groups of three or four, so there were a couple wires coming out of the chest unit that would need to be hooked up to power. I didn't care much about the number of wires needed to power everything, more bare circuitry would make it look a little more authentic anyways. 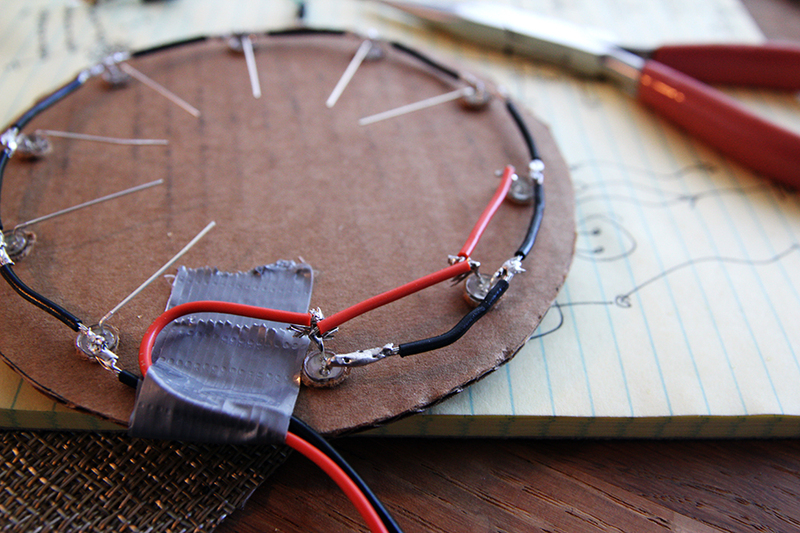 To diffuse the light, I added another layer of cardboard and masking tape to the front to get the outline I wanted. Cardboard and duct tape, because Halloween is only one night. Poor white balance on my part making the blue LEDs look purple. Looks much better with the lights off. 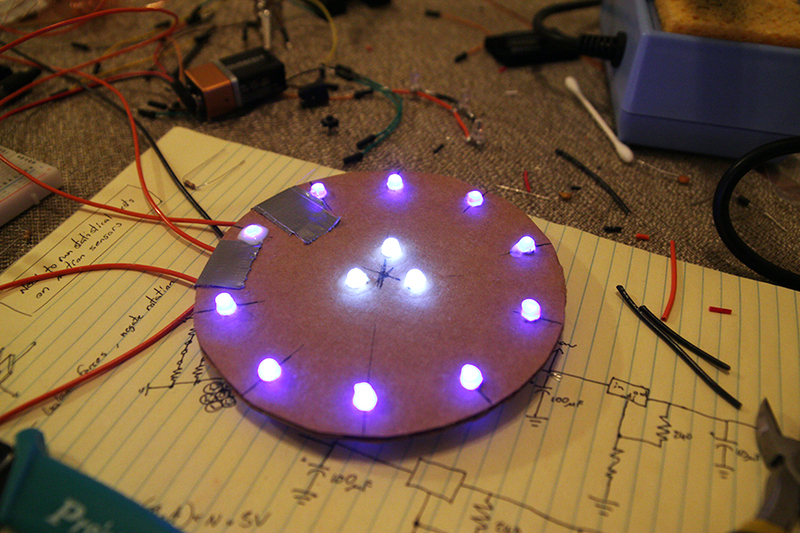 The hand light was made similarly with 7 LEDs (mix of blue and white) on a cardboard backing. For some reason I decided it was not interesting enough to take pictures of while building, so you'll have to use your imagination. 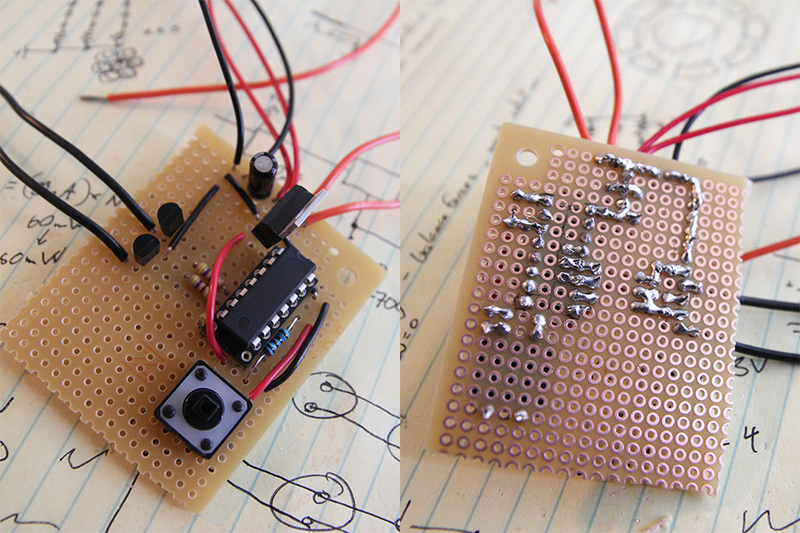 With both lights built, it was time to figure out the controller circuit. I wanted the microcontroller to have complete control over the brightness of the hand and chest units independently, so I wired up a simple circuit that would drive the LEDs with transistors and allow pulse-width modulated output from an ATtiny84 to set the brightness. Final board. Not pretty, but it worked. After burning the Arduino bootloader on to the ATtiny I uploaded a sketch that would slowly modulate the brightness of the chest light like a heartbeat. When the button is pushed, the chest dims, the hand flashes for a few seconds, then the chest comes back on with a faster heartrate that slows back down over time. The full code can be found here. 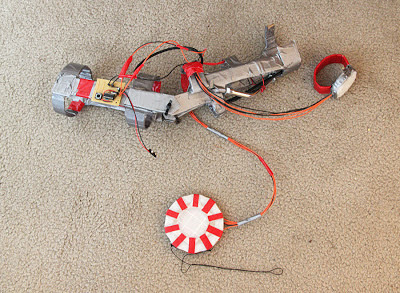 I'm a fan of making my Halloween costumes super-cheap, so the entire arm brace was made out of cardboard, duct tape, and an old motorcycle piece or two. While duct tape obviously isn't the best choice for structural stability, the costume only had to last a few hours of one day. Bright enough to provide dramatic lighting. 1) The ATtiny85 is a great alternative to a full-blown Arduino board when you want something cheap and small. I'll probably use them again in future projects. 2) The lights look nice in the dark, but were far too dim in normal lighting. It might have been worth it to significantly increase the number of LEDs and just be prepared to change the battery every now and then.